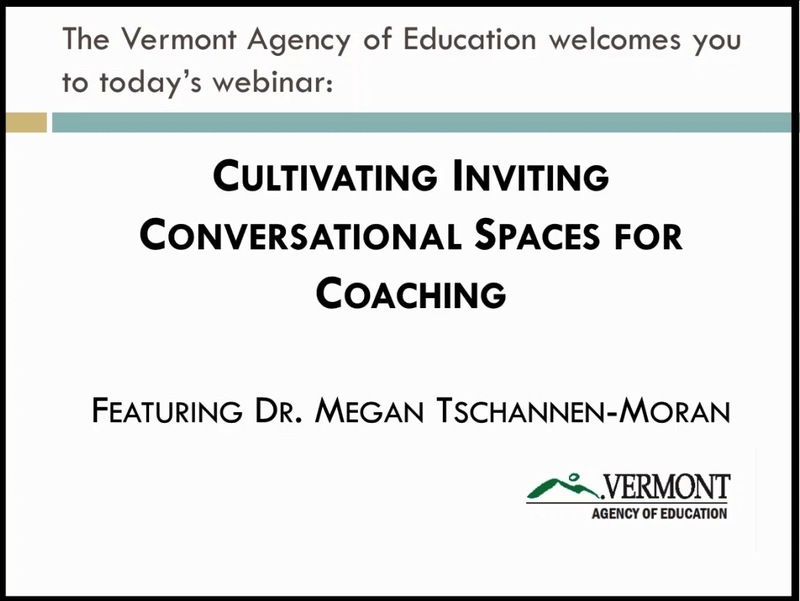 Dr. Megan Tschannen-Moran was a featured speaker at The Vermont Agency of Education‘s session on Cultivating Inviting Conversational Spaces for Coaching, which was presented to about 80 Instructional Coaches, Administrators, Curriculum Directors, and K-12 Educators. In this session, Dr. Megan Tschannen-Moran shared strategies for building trust and fostering deeper connections with the teachers we coach in order to generate greater openness to innovation and an optimistic sense of possibility for their classrooms. She also drew upon key components from the first two chapters of her book Evocative Coaching: Transforming Schools One Conversation at a Time. The Compassionate Communication Guide is also available. 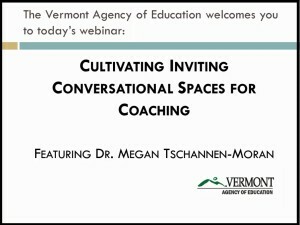 In this BlogTalkRadio radio interview, Bob & Megan Tschannen-Moran, co-founders of the Center for School Transformation, discuss how the Center trains school leaders, instructional coaches, department heads, program directors, mentors, and other educators in the Center’s unique approach for individual performance improvement and whole-system transformation. Based upon the Tschannen-Moran’s acclaimed book Evocative Coaching: Transforming Schools One Conversation at a Time, this person-centered, no fault, and strengths-based model brings together four bodies of knowledge (Story Listening, Expressing Empathy, Appreciative Inquiry, and Design Thinking) to create an extremely effective approach for making schools better, one conversation at a time. Contact us today to learn more and to explore training options, both online and on-site, for yourself, your school, and/or your organization. Watch these YouTube videos to learn more about Evocative Coaching and to get a sense of how our on-site training processes work. Contact Us Today to bring our team to your school or organization!